Strategically positioned in the centre of the Costa Dorada, on one of the most beautiful and climatically appetising waterfronts of the Iberian peninsula, the town of Tarragona, with its two thousand years of history, includes architectural remains of the ancient Roman empire, a deep Mediterranean culture and a truly important potential in the yachting field. A great project was previewed at the last Dusseldorf Boat Show by the very likeable Sales & Marketing manager Maria D. Campabadal, a project which could make this Spanish town the real capital of mare nostrum. International Marina Tarraco (I.M.T.) 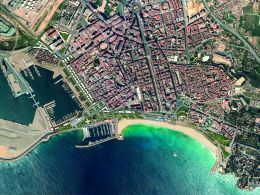 is a wholly private port 50 miles south of Barcelona. Situated between the Balearics and the Riviera, it has excellent motorway and rail links with its hinterland. The waterfront is being transformed into a megaport for maxiyachts. The project, to the design of famous architect Ricardo Bofil, represents an investment of 35 million euros, excluding the part for the construction of buildings. With its three jetties - Muelle de Costa (520 m.), Muelle de Levante (420 m.) and Muelle de Lerida (300 m.) - there will be mooring for no less than 90 yachts of 30 to 120 metres and even up to 150 metres, thanks to a water depth of 9 metres. The designers have paid special attention to environmental aspects, equipping the port with the most modern and innovative technologies both for storage and treatment of sewage from the port structures and the fleet, and for the quays which will include all services from Internet to bilge-pumping. The project is divided into three phases. The first, involving the Muelle de Costa, will be completed by the end of this year. The Muelle de Levante will be operational in spring 2005 and the Muelle de Lerida in autumn of the same year. The three jetties will be "surrounded" by very luxurious terramare that may be rented, thus remaining I.M.T. property.